Now that the wedding and honeymoon are over, it is time to write your thank you cards. While it seems like a lot of work, it is proper manners. 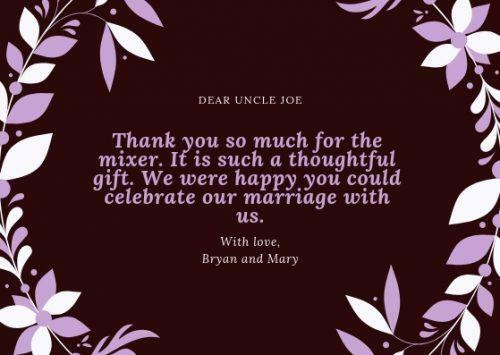 Just as your guests wondered how to write wedding wishes, you might be confused about how to properly construct your thank you cards for your wedding gifts. 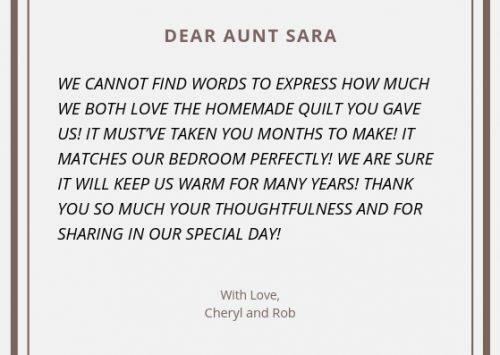 One of the best pieces advice we can offer is to start writing your thank-you notes as a start to receive wedding gifts. This way you won’t feel overwhelmed. 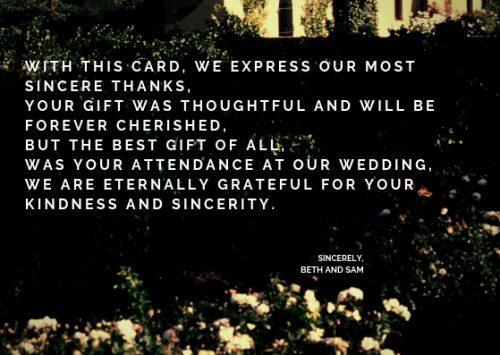 We have gathered some advice from wedding experts on the best wedding thank you cards wording. This can help the process go smoothly and quickly. Thank you card writing is something that will never go out of style. People like it that you remembered to thank them for their gift, or even that they shared in your special day. Remember, some of your guests traveled great distances and made sacrifices to attend your wedding. A wedding thank you card is a great way to express your appreciation for the time, thought and effort they put into your wedding gift. Those who hosted your wedding guests. If you need advice on how to address your thank you notes, refer to our article on How To Address An Invitation. You should send out thank you cards for those gifts received prior to your wedding within two weeks after you have received the gift. For those gifts, you get at your wedding, or after, the proper time frame is within three months. This way you will not have to worry about what to say at the wedding thank you notes on your honeymoon. You can relax and enjoy your honeymoon. When you return home, you can take the time to focus on your thank you notes for your wedding gifts. Are you unsure how to write a thank you note? We have some tips to help you compose your thank you notes. First of all, you should make sure that you have enough thank you notes on hand. You don’t want to run out and therefore have to exclude anyone. Also, make sure you have enough stamps as well. And while it seems like common sense, don’t forget to mail them as soon as you can after you write them. Many couples will finish their thank you notes and set them aside to drop in the post and then forget to mail them. It is also a good idea to keep a list as you write each card. This way you will be sure not to forget anyone. You can find templates online to create a tracking system if you prefer. Or you can do it the old-fashioned way and write a list. Either way, be sure to write down the name of the person who sent the gift, the date it was received and then the item itself. Then check it off after you have completed the thank you note. You would take the time to handwrite each note. 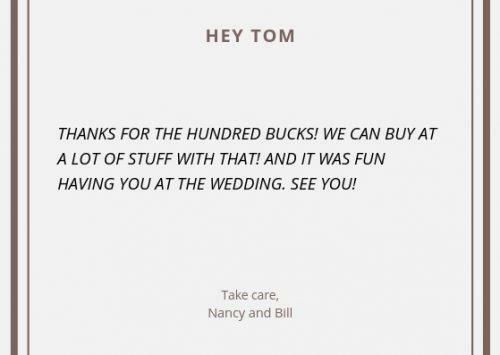 You can purchase blank wedding thank you cards online or at a stationary store. Or if you are artistically inclined, you can make your own. 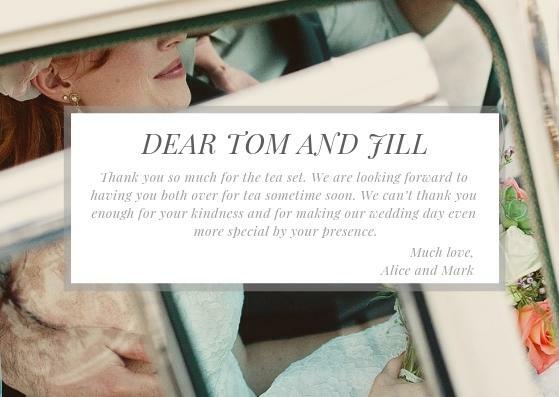 There are plenty of templates online for thank you notes for a wedding or any occasion. Or you could use a graphic design program. 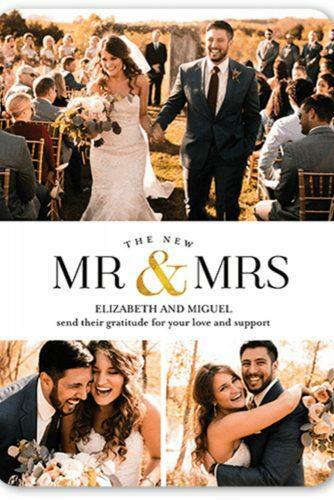 If you send personalized wedding thank you cards, make sure to mention the specific gift and why it is meaningful to you. These will take more time than custom notes, but they will have your personal touch. Custom thank you notes are a great way to make your wedding thank you notes stand out. You can special order personalized cards on sites such as Esty, Shutterfly or any even some wedding sites. 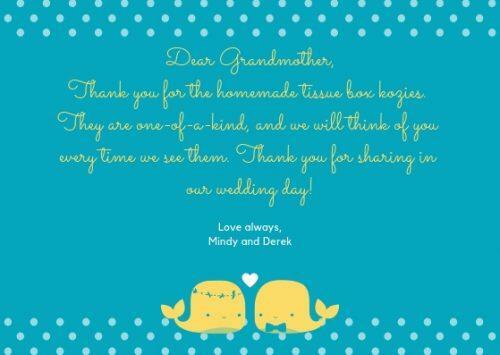 As opposed to generic wedding-themed thank you notes, you can purchase on special stationery. You can choose your own paper and have your names and the date of your wedding engraved or embossed on the thank you note. You can order them in bulk at a discounted rate. With custom bridal thank you cards you would compose a message that would appear on the body of the card. This way, all you would need to do is address and sign the card. You could also hand-write a line or two to make it more personal. As well, you could include wedding day quotes to make it more meaningful. Flat cards are those that are made on card stock. As opposed to a folded thank you card, they will not be creased or bent when sent. You would use this type of thank you card for custom or even photo cards. These can also be ordered on sites such as Shutterfly or Etsy. 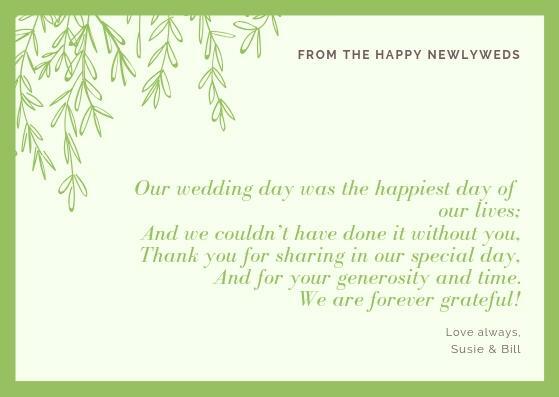 If you want to keep it short and sweet, you can write a simple wedding thank you cards. This is especially helpful if you have to write numerous thank you notes. A few short sentences will do, but always make sure to mention the person by name as well as the gift. 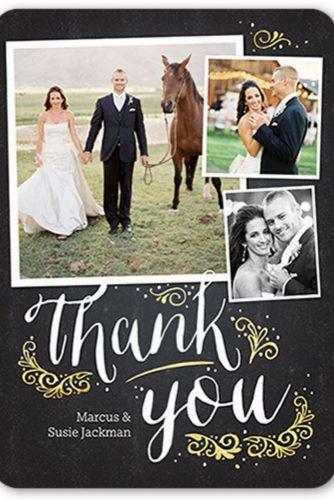 This is another great way to personalize your wedding thank you cards. You can include a photo of your engagement, wedding or even your honeymoon, although wedding photos are the preferred choice. 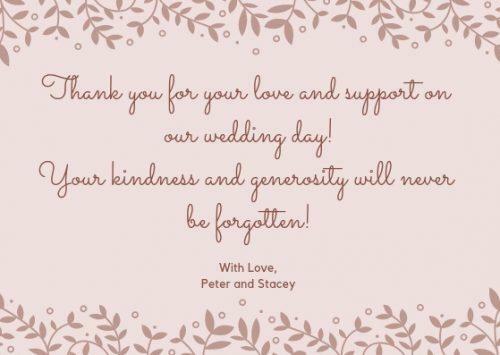 We hope you have gathered some helpful advice from our advice on wedding thank you cards wording. Now you won’t feel as anxious when it comes to your thank you notes for your wedding and you can relax! 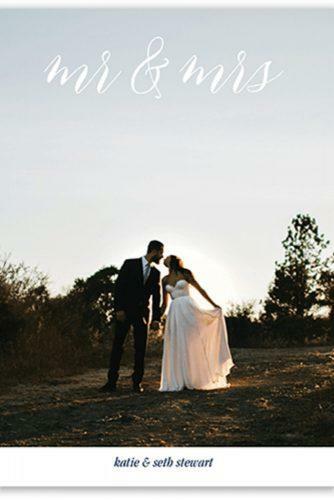 Check out the rest of our site for more helpful wedding advice such as how to compose your wedding ceremony script or how to pack for your honeymoon. Whatever advice you need for your wedding, we have you covered!